Land Use Proposal at 3550 N Central Ave (between Walgreens and Alexi’s) Z-39-13-4 This is a large residential and commercial project proposed for the site. It extends from Central to 2nd Avenue. This comes before the Encanto Village Planning Committee on Monday November 4 at 6:15pm at the Phoenix College Willo Conference Room, Flower & 11th Ave. This room is not easy to find. It is at the NW corner of Flower and 11th Ave, the first walkway at the south end of the complex. With development activity picking up, it’s good to make your voice heard in the process. 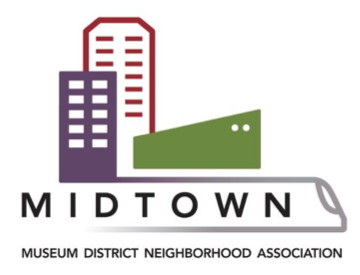 The Midtown Museum District Neighborhood Association (MMDNA) board meeting will be held on Tuesday, January 8 at 4:30 p.m. at Hob Nobs, 149 W. McDowell Rd. All are welcome. You are also welcome to email to info@midtownmuseumdistrict.org any questions or comments that you would like addressed at the meeting. On the agenda: March 10 Block Party, Hance Park Classic 100 event, Block Watch issues, review of December event and plans for other events/activities, and status of the Midtown MUSE newsletter. Also, join Mayor Greg Stanton and Councilman Simplot for a morning coffee chat at Citizen Espresso Bar, 4700 N. Central Ave., on Thursday, January 10 at 7:30 a.m. MMDNA will discuss some of our accomplishments in 2012 and our goals for 2013. 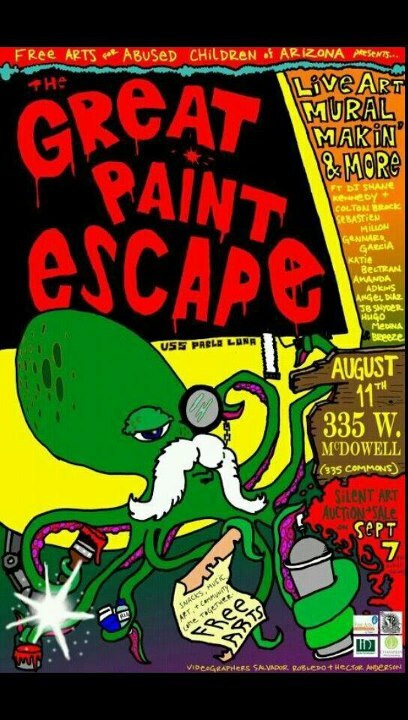 Harder Development and Free Arts for Abused Children of Arizona are proud to present an exhibition and silent auction to benefit Free Arts on Friday, September 7, at 335 W. McDowell Rd. Silent auction bidding will begin at 6 p.m. and end promptly at 9:30 p.m. Participating artists include: (Curator) Hugo Medina, Sebastien Millon, JB Snyder, Angel Diaz, Katie Beltran, Amanda Adkins, Colton Brock, Pablo Luna, Thomas Breeze Marcus, Gennaro Garcia, Lauren Lee, Isaac Nicholas Caruso, Kyllan Maney, and Aaron Johnson. Background: Ashley Harder, President of Harder Development, hosted a community mural and painting project with a dozen local Phoenix artists and Free Arts youth on August 11, 2012. Kids worked side by side with artists to create a community mural on the building, as well as painted with artists on canvasses. [Source: Phoenix Community Alliance] – The Central Avenue Committee of the Phoenix Community Alliance will meet on Wednesday, September 12, 2012 from 1:30 PM to 3 PM for an update on Central Avenue activities and plans for renovation and a tour of 2828 N. Central Avenue, one of the few examples of Brutalist architecture in Phoenix. To register on or before September 10, click here. For parking, enter on west site of garage. Take your parking ticket to meeting for validation. The attendant will direct you to 2nd level. Meeting will be held on 13th floor. Get ready for a new bike and beer festival on April 23rd at Steele Indian School Park [near] downtown Phoenix, the SanTan Wheelie Jam. EVERYONE should be there, and bring all your friends too (oh and make sure everyone buys a few beers). This is an all local festival, local bike groups, local beer (SanTan brewing), local food, local bands, local bike shops. TBAG is getting it going, and all beer sales proceeds will go to Phoenix groups like Rusty Spoke, AZ Bike Polo etc. Right now we need to line up sponsors and bike activities. We can do roller wars, mini/tall bike rides and races, riding contests, fixie trick demos, bike build offs, giveaways etc. Contact ryan@biketempe.org if you know someone who wants to sponsor the event, or can help provide some kind of bike related fun. Also let me know if you can help plan the event or would like to volunteer at the event. Any non-profit or club that wants to get the word out about their group is welcome at the event. There will be table space, you can do fliers, stickers, or sell merch. This festival is for and by the local bike community. It’s all new so it’s a great place to try new ideas and get people excited about riding bikes and being involved in their local community. ​The Heard Museum is about to get a little bit sweeter. The downtown art venue announced this week that it will open a new book store and coffee shop (that’ll serve margaritas, too), dubbed the Coffee Cantina, with an opening bash on Friday. ​According to museum representatives, the cantina will serve up gourmet blended drinks, teas, and snacks. Added bonus: Every bean of Heard Museum brand coffee is grown organically in the Americas and locally roasted in Cave Creek. Playing towards the latter part of the its name, the Coffee Cantina will have a bar option available so museum goers can get themselves a nice margarita after perusing art exhibits. Both the cantina and book shop will be officially opened for business after a ribbon cutting ceremony on February 11, followed by a book signing with former Supreme Court Justice Sandra Day O’Connor on February 12. The Coffee Cantina will serve customers Monday through Saturday from 9 a.m. to 5 p.m. and 11 a.m. to 5 p.m. on Sunday. 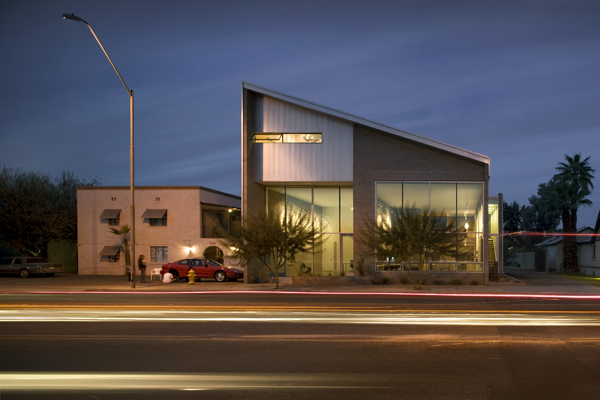 The Heard Museum is at 2301 N. Central Ave. in Phoenix. For more information, check out the Heard Museum website. There’s something special about sitting down over a meal and how it brings people together and forms a special bond between them. This is what happens at the Places, Spaces and Faces Community Dinner (PSF) every month. This event started about a year ago by some dedicated Phoenix residents who were craving community, Yuri Artibise, Kathleen Bartolomei, Jim McPherson, Marshall Shore and Taz Loomans. Theme: Come “C” What’s Cookin’! Feel free to interpret this concept creatively. “C” can stand for Casseroles, Carrots, Cookies, or Cucumbers. Think Cake, Corn, and Calamari. Serve your creation on a Cake Stand, in a Carafe, or atop a Chia Pet. Consider Chicken, Cheese and Cashews. And Chocolate (after all, January 22nd is National Blond Brownie Day). Oh, and definitely Cocktails! As usual, there will be a people’s choice vote to determine three prize winners in the categories of “top savory dish,” “everyone’s favorite dessert,” and “the evening’s best beverage.” After Hours Gallery permits alcohol so feel free to play with booze in your shared dish or drink. Please bring your own plate, cup, napkin, and silverware. We’ll again utilize a buffet setup, like we did with December’s dinner. Please label your shared savory/sweet/liquid contribution to share and highlight any prospective allergens (particularly if you are working with alcohol). Burton Barr Central Library will host an exhibit by Deborah Springstead Ford, titled “Cartography and the Cultural Terrain III,” Jan. 12 – March 20 at the library’s @Central Gallery, 1221 N. Central Ave. In this body of work, Ford combines photographic images of landscapes and geological forms with historic maps and text to explore the ideas surrounding westward expansion, colonialism and the search for natural resources. Ford uses photography to engage viewers with issues of the environment and our relationship to it. Her images are often altered in the camera or in the darkroom, using various photographic techniques, resulting in one-of-a-kind pieces. 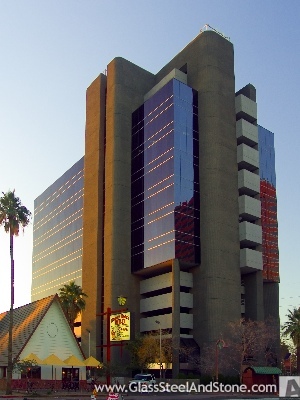 Phoenix Public Library is a system of 15 branch libraries and the Burton Barr Central Library. For more information, call 602-262-4636 or visit www.phoenixpubliclibrary.org. Follow them on Twitter at www.twitter.com/phxlibrary.